When choosing your gap year program you will be faced with the choice between Tel Aviv and Jerusalem. In both cities you will have the same range of options, you can take different study programs, sign up for different internships, and experience a unique part of Israeli society. However, the cities have very different characters. Tel Aviv is more of a global city while Jerusalem is unique in its character. 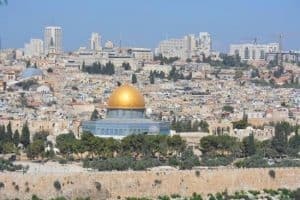 There are many advantages and disadvantages to both cities but here are a few reasons why Jerusalem may be the better choice. To start with the weather in Jerusalem is far more bearable for those that aren’t used to hot and humid weather. The humidity levels are far lower in Jerusalem and in the evenings, even during the height of summer, it cools down to a very comfortable temperature. Even during the days it is normally bearable in the shade. Of course Jerusalem’s real selling point is the Old City. There is nowhere quite like it on earth and it’s atmosphere is truly special. By living in Jerusalem you will have plenty of time to explore the Old City, taste the foods on offer in the markets there, get to know its layout and in general discover for yourself what makes it so special in a way that is hard to achieve in just a single visit. In a similar way, Jerusalem is rich with history and is a truly diverse city. You will struggle to find anywhere else on earth that has so much history associated with and the opportunity to live in the midst of this history is truly special. Furthermore, the make-up of the city, with religious and secular Jews, Muslims and Christians, give it a very distinct character. One of the most amazing things about Jerusalem is how the city changes for Shabbat. Almost instantaneously the city transforms from a noisy, bustling place full of people rushing around to a much calmer and relaxed atmosphere. The contrast is so big you have to experience it to truly understand it. However, this doesn’t mean that there isn’t plenty going on in Jerusalem. While it is true that the city is home to many religious people, it is still a modern city full of cafes, restaurants, bars, pubs and clubs. At any time of day and on any day of the week you can head into town and find a range of places open and serving. Many people will have preconceptions about Jerusalem, that it is a place where only the religious live, that it is an ‘old’ rather than a ‘modern’ city and that it is dull in comparison to Tel Aviv. However, after just a short while in the city you will discover that all of this is true and false in equal measure and it is precisely this that makes Jerusalem such an interesting and enjoyable place to spend your gap year in Israel.